This here's all about being sure you have fresh staples on hand for when you need them. Have you ever had to scrape away at the inside of a baking powder can to get enough for your recipe? Do you have spices from early in the Bush Administration...the FIRST Bush Administration? (I've seen Cream of Tartar with a "Vote for Nixon" sticker on it). Does the inside of that jar of alfredo in the fridge look more like Angora than Asiago? Open Dating is our simple little way to keep tabs on a number of items throughout our kitchen. As soon as new container is opened, and we know we won't be using it all, we immediately write the open date on the lid or label. That way, we always have an idea of freshness. Enter the Sharpie. Buy these things by the case, they are useful EVERYWHERE. While super-duper-economy-sized spices sounds like a great monetary value, they'll soon lose culinary value if not use in a timely manner. ...speaking of using things in a timely manner... here's a great hint for those open jars of stuff that also happen to be freezer friendly - like the alfredo, applesauce, or marinara. Get yourself a couple of ice cube trays. They don't need to be expensive -the dollar store variety will do just fine. Measure your leftovers into the trays - I found mine usually held about 2 tablespoons, but you can measure yours up ahead of time. Stack in the freezer and let freeze overnight. (if you have concerns about the foods picking up odors, you can cover with freezer wrap prior to freezing). 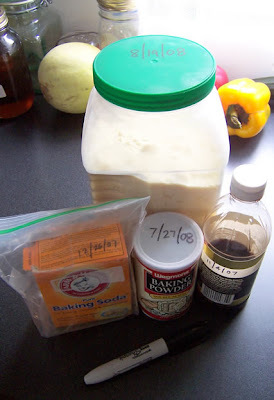 Once frozen hard, remove them to a zipper top plastic bag, label (with the Sharpie of course!) and store. Little cubes of juice are great in the summer in ice tea - they don't water it down. Little cubes of pasta sauce (any flavor) are good for single servings, or adding to another recipe. Little cubes of applesauce -well they can be used in baking... but that's another post for another day. Great tips! Thanks guys. Especially the ice cube ones. I always have left over tomato sauce and end up throwing it away. Now I know what to do with it! I'm off to the dollar store for some ice cube trays!